Steels aftersales prides itself with the consistently high level of service provided to all of our customers. We are the main dealer for Honda in Herefordshire and also provide full service facilities for the numerous other marques sold by our used car department. Herefordshire based Steels is one of the country's longest established, privately owned, Honda dealers, we also offer an extensive stock of used cars. The best way to discover the difference we deliver, is to come and see us, in the mean time, enjoy your virtual visit. Steels have occupied their city centre site since 1976 and are now Herefords longest established car dealership operating from its original premises. We are well known for the quality and preparation of our used cars and the outstanding after sales back up we provide. Consistency and continuity have always been key factors in the business which has resulted in an incredibly low staff turnover. Customers are always greeted by a familiar face and this has led to us having huge customer retention. 1980 saw us appointed as Honda main agent for Herefordshire and now 36 years later we are one of the country's longest serving dealers who has consistantly received awards for our customer satisfaction. 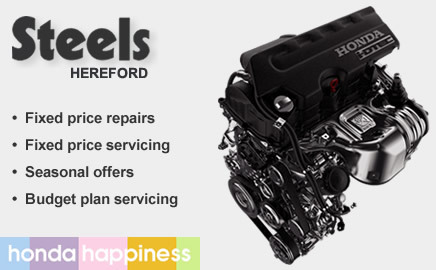 So if your car needs servicing, MOT, or you are looking for a new Honda, or a quality used car, Steels is the garage for you.